When it comes to matters of economy, I think of myself as libertarian. I believe in free markets, free trade and limited government. But I must confess, our Latino neighbors are challenging my libertarian instincts regarding our immigration conundrum. 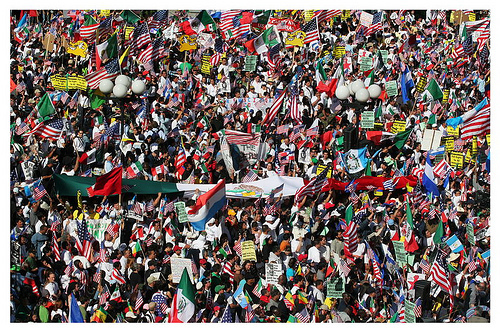 The recent pro-immigration demonstrations around the country have been a major turnoff. There is something not convincing about illegal immigrants demonstrating to claim they have inalienable rights to come here, be here, work here, become citizens here – and make all these claims in Spanish. Hearing “We Shall Overcome” in Spanish just doesn’t provoke my sympathies. I don’t buy that, along with life, liberty and the pursuit of happiness, our Creator endowed anyone with the right to sneak into the United States, bypass our laws and set up shop. Maybe our immigration laws do need fixing. But this is a discussion for American citizens. In English. This could be the finest hour for the political left if we really can be convinced that illegal immigration is a right, that those here illegally are innocent victims, and that the real guilt lies with U.S. citizens who believe our laws mean something and should be enforced. Draping these bogus claims in the garb of the civil-rights movement is particularly annoying. The civil-rights movement was about enforcing the law, not breaking it. The Civil War amendments to the Constitution were not getting the job done in what has been a long struggle in this country to treat blacks as human beings. If Americans were kidnapping Mexicans and selling them into slavery here, I might see the equivalence. But these are free people, who chose to come here and chose to do so illegally. Just considering Mexicans, how can we understand their taking to the streets of our country to demand rights and freedom when they seem to have little interest in doing this where they do have rights, which is in Mexico? There is no reason why Mexico – a country rich in beauty and natural resources – cannot be every bit as prosperous as the United States. It’s not happening because of a long history of mismanagement, corruption and excessive government. Although Mexico is a democracy, for some reason Mexicans seem to need to be north of the Rio Grande to get politically active and demand the benefits of a free society. Last year, the Pew Hispanic Center surveyed adults in Mexico and asked them if they would come to the United States if they had the means and opportunity to do so. Forty-six percent responded yes. Almost half of Mexican adults said they’d rather live here! When asked if they would do it illegally, more than 20 percent said yes. Yet in the current contest for the Mexican presidency, the leading candidate is a leftist former mayor of Mexico City who is polling in the high 30s. Maybe you can figure out why almost half of Mexican adults say they would rather live in the United States, presumably because of the opportunities our free society affords, yet vote for a leftist candidate who will continue policies in Mexico that choke off any prospect for growth, prosperity and opportunity. So forgive me for being a little suspicious of the wholesome picture being painted of these folks who are pouring across our border allegedly just to be free, work and maintain traditional families. Anyone who lives in Southern California, as I do, knows that the Latino-immigrant community is far from the paragon of virtue that the forces who want to encourage open borders would have us believe. I see much of the same troubling behavior that blacks get tarred with. Much of the gang behavior in Los Angeles, unfortunately, is Latino-related. The L.A. Unified School District is over three-quarters Latino, who drop out at the same alarming 50 percent rate as inner-city blacks. Out-of-wedlock births among Hispanic women approach 50 percent. Those who want to hoist the banner of the Statue of Liberty, Ellis Island and the American tradition of immigration should remember that when immigrants were passing through Ellis Island at the early part of the last century, the federal government accounted for about 3 percent of the American economy. Today it is 25 percent. Part of the package deal that comes with showing up in the United States today is our welfare state as well as our free economy. Illegal status is really a temporary situation, anyway. Illegal immigrants’ children who are born here are U.S. citizens. Significant demands are being made on our tax dollars in the way of schools, health care and government services, including law enforcement. Yes, let’s encourage freedom. But freedom is a privilege and a responsibility. We have enough people already here who think it’s all about entitlement.